AWS IoT allows you to quickly connect and work with IoT devices in a highly-scalable, reliable, and secure environment. 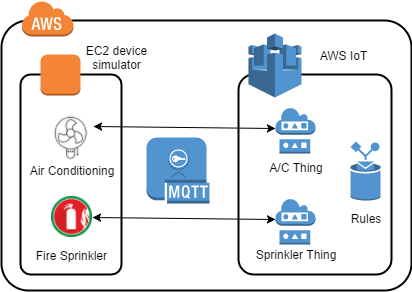 Explore the main concepts in AWS IoT by working through a scenario where you connect and manage two types of devices in an office setting. In AWS IoT things are registered to represent physical devices. Things provide convenient ways of monitoring and communicating with the underlying devices that they represent. The state of things can be retrieved and updated using thing shadows. You will learn everything from securing communication with your devices to getting an overview of your IoT ecosystem. October 23rd, 2018 - Updated the root CA certificate used by the device simulator to the new default Amazon CA (changed from Verisign). Instructions and screenshots updated to reflect the latest interface.